Entry by lambdadelta on Mon Aug 15 18:03:59 2016. That appearance suits Shinji, he acts like a baby most of the time anyways. what a perfect look for such a pathetic, selfish, coward. uh no. Shinji is NOT pathetic yeah he may be whinny or cowardly. But of freaking course he would be. His freaking father left him at four years old , never talked to him since then and his freaking mother died. Then randomly his father contacts him and asks for him. Shinji already developed many psychological issues from his childhood and his father suddenly calling for him made him feel like he was wanted and loved. But that was complete crap! Shinji then develops more issues because of this father telling him to pilot a freaking robot and kill these freaking weird angels or the freaking world will end. I doubt anyone ANYONE would do that , Shinji didnt even know how to pilot an eva nor fight but he FREAKING DID IT. RESPECT. Yeah he wanted to runaway, in that situation I would ran away and never come back. But Shinji always came back. For someone who has has avoidant personality disorder and other issues.., he had a hard time given such a HUGE responsibility. And! Shinji finds out the girl he kinda likes is a clone of his mother that would screw someones head up bad. Then the only person to ever treat him very kindly and say they love him he had kill with his own hands. AND Asuka the girl he loves she treats him like crap because she got issues too and they dont know how to express each others love for the other, Shinji then goes crazy and strangles her. 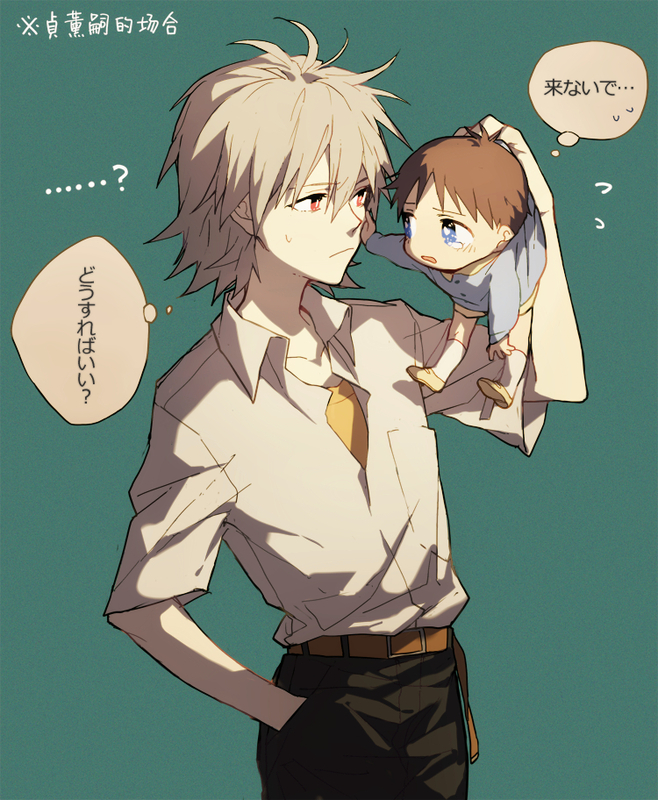 Kaworu: What should I do? I don't know what the text in the top left says.